Inder Loves Folk Art: Roly Poly! I am an unapologetic fabric hoarder. My modus operandi is to buy fabrics that I love, just because I love them, usually 2 or more yards. Sometimes I have a specific project in mind and sometimes I have only a glimmer of a possible project ... sometimes I have no idea what I plan to do with the yardage! I take my fabric home, wash it, fold it up neatly, and then let it sit in my stash until inspiration strikes. I have fabrics in my piles that I have had for a decade or more. I love them - I just haven't found the perfect thing to do with them yet. But I will! I don't consider myself a "collector" - that is, I am not just collecting for the sake of collecting - I sew from my stash constantly and consistently. Like any artist, I just like to have lots of great supplies on hand. So here we go! 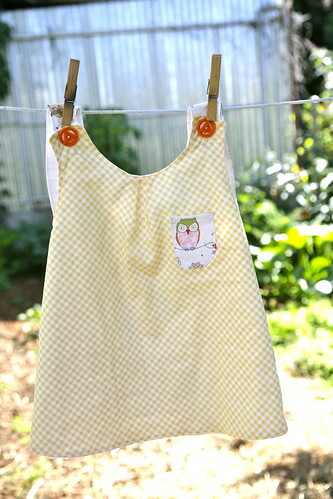 First up, I made a Roly Poly Pinafore for Maggie! This is Imagine Gnats' adorable new pattern - a reversible cross-back apron/pinafore dress with buttons on the shoulders and an inverted pleat in the front. The pattern can be made with just one piece (front wrapping around to the back), but I opted to use two different fabrics: yellow printed gingham for the front (it's printed to look like it's on the bias) and some precious owls I've been stashing for years for the back. Because both fabrics are a little sheer, I opted to line it in muslin rather than make it fully reversible. I decided the front needed a little useless owl pocket. Just cuz. These fantastic vintage buttons have been in my stash forever. I love them. I was so excited to finally put them on a project that is worthy of them! Love these owls and all of their expressions! This pattern is super easy and fast to sew up. 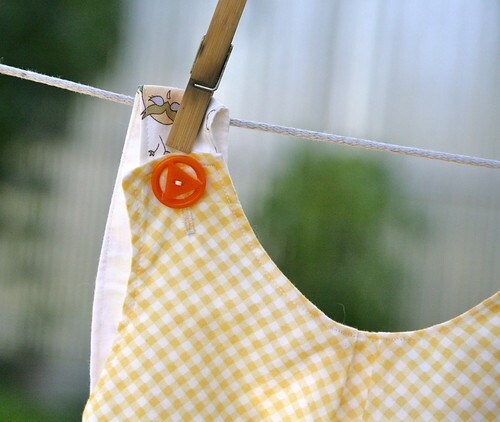 Seriously, it is the ideal project for someone brand new to sewing - very simple and satisfying! And I can see it in a variety of fabrics and weights. Love. It. There is only one problem. It's way too big for Maggie! WAAAAAAAAH. It looks okay (if a bit long) from the back. Oh, well, there is only one possible solution: Make another one, in the smaller size, that Maggie can wear right away. Oh, it is so cute! 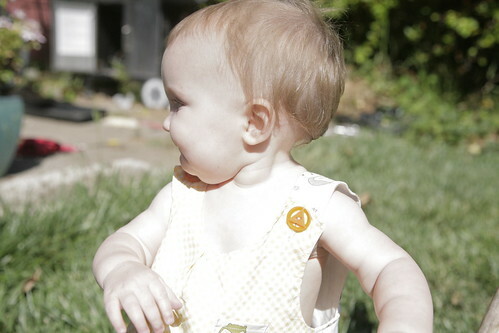 I'd send some growing vibes to Maggie - but really, you don't want her to grow that fast, huh?? I love that look on her face in the last picture...as if she's saying "really, mom? This is obviously too big." Too cute! And I can't wait to see your next one!! 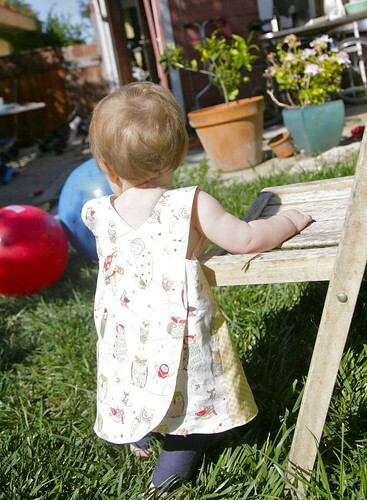 She'll be rocking her little pinafore all summer! adorable! so so so cute!! You are TERRIBLE for my need to buy new patterns! Seriously - another cute pattern that I need to make the girls? 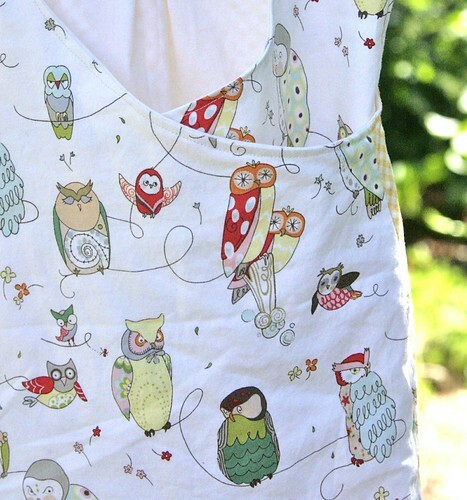 LOVE the owl fabric too! And um, you should see the stash of fabric that I've aquired in the 1 1/2 years since my old stash left. It's impressive I must say! My husband is trying to limit it to a specific area but he also knows how much I like to sew so doesn't complain too much! So darling! 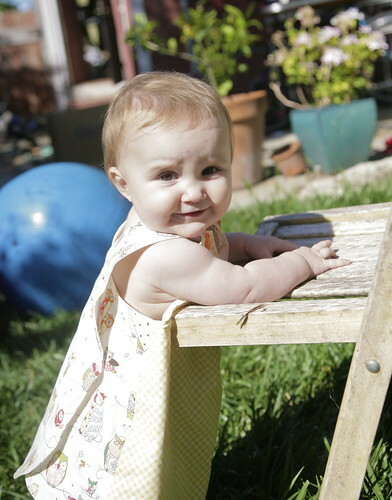 I tried making a pinafore like this from a free pattern when my daughter was about a year old (pattern said 6-12 months) and it was HUGE!! I've been eyeing the Roly Poly since I hoped it would fit better. And BTW, I've been following your blog for awhile (but haven't commented before), and I nominated you for the Liebster Award (http://creativecounselor.wordpress.com/2013/06/21/the-liebster-award/). Just adorable! Hope she can get some use out of it. Indian summer, maybe? Love, love, love the owls!